Being in The Zone is such a great feeling, that I, and I figure you, would like to get a deeper understanding of what it’s all about. The role of an educator, they said, is to focus on that middle layer. That is, assist children in learning something new by building on what they already know and helping them along. It’s one of those concepts that is both intuitive and powerfully logical when presented that simply. Unfortunately, Vygotsky called that middle layer the “Zone of Proximal Development.” The phrase does make sense if you study and think about it long enough, but it caused normal people’s eyes to glaze over and wonder what the hell he was talking about. And the bewilderment got worse! In my words, Vygotsky also promoted the notion that intelligence is best measured not by the facts a child knows, but by measuring a child’s ability to solve problems both independently and with an adult’s help. Again, intuitive and powerfully logical. And again, frustratingly obfuscated by all the surrounding, scholarly psycho-babble. Fortunately, there have been enough pragmatic scholars & psychologists since the early 20th century to expand and extend the framework. I’ll skip discussion of all the steps in that process, and move on to my understanding of where the thinking now stands. It has grown to encompass not only on how adults learn – how all of us learn – but also on how to continue that personal development, realize fulfillment and ultimately, if we’re lucky, achieve genuine self-actualization. It’s some pretty intriguing stuff! Here goes… The best way to think about The Zone and how to get yourself there is as a 4-stage cycle. (See the diagram.) Stick with me as I walk through it all. It only makes sense when it’s clear how the 4 stages interconnect. The first stage is voluntary Assumption of Responsibility. That notion might feel like it just came in from out of the blue. That’s exactly how it felt to me at first. We’re talking about that wonderful, deeply personal satisfaction that comes with being in The Zone. What does that have to do with all the responsibilities of adulthood? As I said, it only makes sense when it’s clear how the 4 stages interconnect… Anyhow, when we voluntarily take on a responsibility and commit to it, it becomes an integral, non-negotiable part of us. Most significantly, it compels Purposeful Action, which is stage 2. Obvious, right? Because we have voluntarily committed to fulfill a responsibility, we are self-compelled to do whatever it takes to meet that commitment. Note here that the commitment can range from something small and short-term like showing up for dinner on time, to something big and long-term, like saving up enough money to send that new baby of yours to a good college. It can be a commitment to just yourself, or one to your family, friends,community, company or country. Now… Think about your state of mind when you are taking decisive action to accomplish something that moves you toward fulfilling a commitment. Feels good, right? Feels meaningful. Deepens the commitment. Gets you even more fully engaged in the activity. That’s stage 3, Meaning and Engagement. And when you get deeply engaged in a meaningful activity what happens? You get better at doing whatever it is you’re doing. Your grow. You make yourself better. Stage 4 Self-Improvement happens. Finally, the loop gets closed because now that you’re a more capable individual, you have the ability to address and solve more problems. You have the capacity to assume more responsibility. Pretty cool, huh? Now look at the diagram again and notice the darker shading at the center of the 4 circles that represent each of the 4 stages we just discussed. The lighter areas toward the outside of the Responsibility circle, for example, represent smaller, shorter-term, more self-focused responsibilities. The darker areas toward the center represent larger, longer-term, responsibilities that involve other people. The lighter areas of the Action circle are relatively easy tasks. The darker areas contain the really challenging stuff. In Meaning & Engagement, it’s the fairly interesting, vs. the deeply, intensely fascinating. In Self-Improvement, it’s getting kinda’ better at something vs. being smack in the middle of the freaking ZONE! 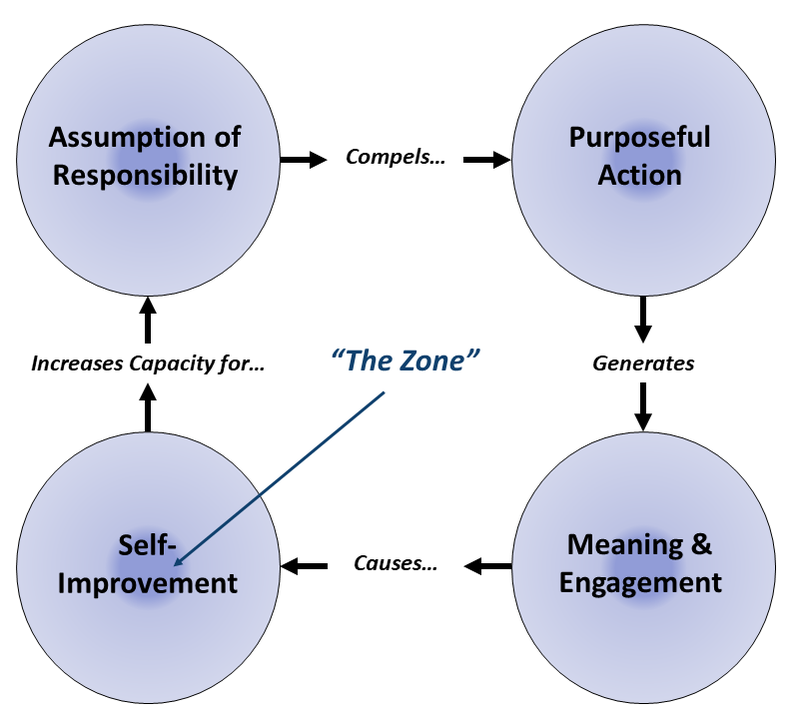 At this point, I want to return my earlier comment about how stage one of consistently getting yourself back into The Zone is focused on responsibility seemed like it had come out of the blue. It really IS surprising that the selfish goal of being in The Zone is all wrapped up with what your mom told you when you were a kid about becoming more responsible. Could it be that we are somehow psychologically or physiologically or neurologically wired such that pursuit of our own personal self-satisfaction depends upon voluntarily assuming a deep responsibility for the well-being of the others around us? Whoa… Pretty heavy stuff. In my opinion, worth thinking about a whole lot more. In any case, you almost certainly know what it’s like to be in The Zone. You want more. You crave more. You need more! Seriously… Think through all the different times you found yourself in The Zone. What drove you to get there? How did you get there? How did it feel? What did you learn? What did you get better at doing? What did you do next? In what way did you grow as a person? I’m your Intentionally Vicarious host, Todd Youngblood – and I know what it’s like to be in The Zone. I’ve already answered those questions for the times I’ve been there. I’m now focused on executing the 4-stage process to get there again …and again …and again. Need I mention that it’s fun? That I’m still having more fun than anyone else I know?